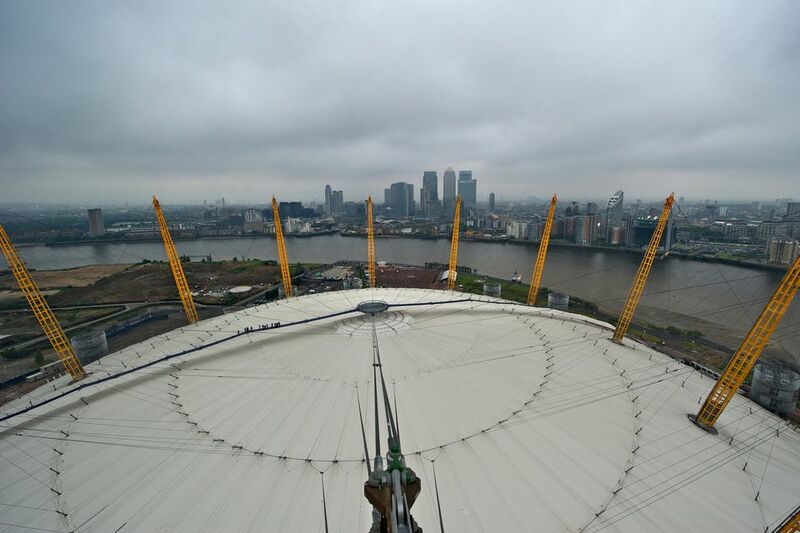 In June 2012, The O2 celebrated its fifth birthday by opening a new attraction: a climb over the top of the iconic O2 building! There's a reason this place is the world's most popular entertainment venue as they offer diverse ideas such as this incredible climb. At the summit, there's an observation platform where you're free to take photos and enjoy the views but hold on tight for the climb which is 52 meters above ground level and reached via a tensile fabric walkway. The climb is pretty steep so you need to pay attention to the safety instructions. Your visit to 'Base Camp' starts with a waiver to read and sign so you are made aware of the risks involved, and then watch a short but somewhat humorous health and safety video. From here you're taken through to get changed into a climb suit which goes over the top of your normal clothes like an overall. It has long zips and Velcro to make it easy to put on. You must wear flat shoes with a good grip and climbing boots can be provided or you can wear your own if the safety team give approval. You can see me wearing my climb suit. The climb suit has a pocket on each sleeve to fit a camera phone but actual cameras are not allowed. As well as the climbing suit, everyone wears a harness which goes around the tops of your legs and over your shoulders, and you put it on rather like a backpack. When all straps have been tightened you add the climb clips and your guide takes you to the base of the climb for training on how to attach yourself to the safety wire. The climb can happen in most weather conditions (unless considered unsafe) and the walkway can be slippery when wet so listen carefully to all instructions. You go up single file with up to 15 people in each group along with an experienced Guide. There's a central handrail and it's important to keep at least one hand on it at all times as sudden gusts of winds feel much more forceful above ground level. The start of the climb and the end of the climb are the most challenging but it levels off nearer to the summit where you'll find a flat, circular observation platform. As there is a barrier around the edge of the platform you can be unclipped from the safety wire and are free to move around and take photos. Actually, you're very much encouraged to take photos although you cannot take a camera up with you, just a camera phone. There's WiFi so why not post a photo to Twitter or Facebook from up there? There are signs around the edge of the platform to help you recognize the landmarks and the Guide can point things out for you too. The climbing area to spot is Canary Wharf but once you know where to look you can also see Historic Royal Greenwich and the London 2012 Olympic Park. Go back to the Canary Wharf view and look between the buildings and you'll find The Shard and City Hall, iconic buildings in central London. The cable car is also impressive from up here so do wave to the passengers going past! This isn't the same as the view from The London Eye as this isn't central London but you'll see an area of southeast London undergoing incredible regeneration as the docks, once vital to London's maritime prowess but now derelict, are transformed to new uses today. The whole experience – from the safety briefing, putting on safety gear, the climb up and down – takes 90 minutes. Anyone who is medically fit and has a spirit of adventure can do the climb, and while there's no upper age limit, children must be over 10 years old and at least 1.2 meters tall. Having tried the climb I agree that younger children may be scared on the way and they need to be physically strong enough to hold on to not be buffeted around by the winds which are felt more forcefully at higher levels than on the ground. It's the same price for adults and children. The only discount available is for O2 mobile phone customers who can download a free app called Priority Moments and then book with a 15% discount. If you are booking for a few people it may well be worth getting a Pay As You Go O2 SIM card for your mobile phone to benefit from the saving. You can book on the day but to guarantee a time slot that's suitable for you it's better to book online. Full details on the official website: www.theo2.co.uk/upattheo2. Up at The O2 is open all year round (weather permitting). When you finish your climb, you exit through The O2 which has lots of restaurants and cafes so you can have a seat and take in what you've just achieved! Find out about more Tall Attractions in London.